Spectral, the first parametric Google font by Prototypo. We are creating 10 parametric fonts based on the Spectral template in Prototypo. Hang on, it won’t take long. Slide your finger inside the boxes with the arrows to change the font parameters! Spectral, designed by our partner Production Type, is the first Google font turned parametric by Prototypo. Opening up to a new era of type design, the parametric font technology allows to work with responsive characters improving creativity and exploring new shapes. Make custom unique fonts, stronger design identities and even better user experience. 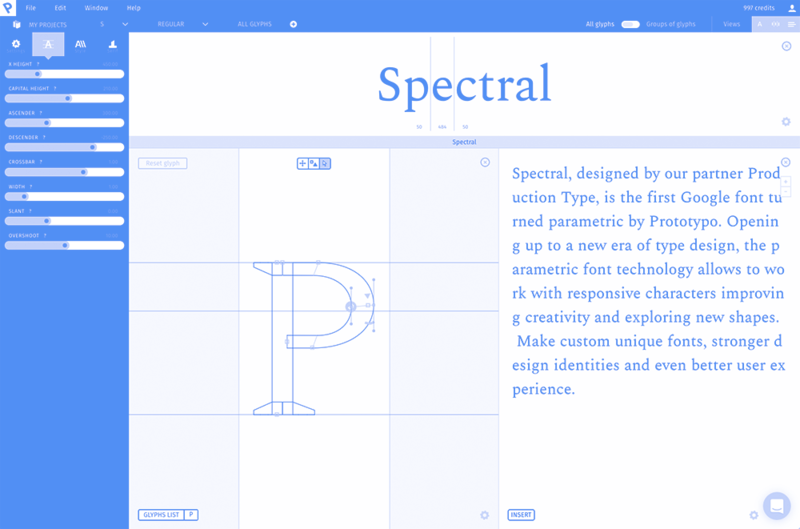 Discover Spectral, the first parametric Google font by Prototypo! Prototypo’s outstanding technology has an infinite range of applications beyond its primarily “web-app use”. Imagine shop windows that react according to the movements of passers-by. Think data visualisation mixing info and text or websites with a readability enhanced for visually impaired people. Creating intelligent fonts capable of fitting all types of uses and media is now a reality. The parametric font technology will help developers and designers to revolutionize user experience with fonts using context, outside variables or physical sensors to modify the input parameters. The responsive typefaces are here, the only limit is your imagination. Create Stronger. Design Faster. Custom Fonts. Prototypo empowers designers to create stronger identities improving design with unique fonts and so, clients satisfaction. Start now with one of our four font templates, make something unique fitting your projects. Want to tweak more than 30 parameters ? Follow us on Twitter, Facebook, Instagram and Youtube.